Old Bhojpuri movie poster of the Indian film Bidesiya (1962) for sale. 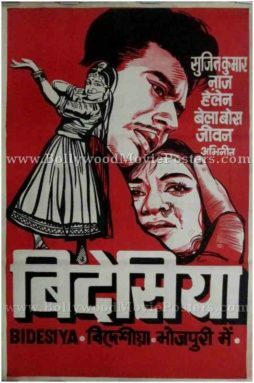 Featured here for sale is a rare surviving old Bhojpuri film poster of Bidesiya (1962) that was directed by S.N. Tripathi and featured Sujit Kumar and Kumari Naaz in lead roles. The film also featured noted Bollywood dancer Helen. Printed and circulated a few years after the first release of the film (somewhere in the 1960s), this old Bhojpuri movie poster was originally designed for publicity of the film but never ended up being used. This old Bhojpuri movie poster was originally designed in oil on canvas format by a small time art studio in Kolkata, giving it a very quirky appearance. The lead couple Sujit Kumar and Naaz are seen in a passionate embrace prominently in this old Bhojpuri movie poster. Their portraits seem to be hand drawn using the popular line drawing techniques employed by old school Bollywood poster painters and street artists of the past. A black and white rendition of Helen in a dancing pose is seen alongside. The entire poster has been designed and printed in a single color – understandably to keep printing costs low (as was the norm with old Bhojpuri movie posters). The title of the film appears in white at the bottom with a translation into English as well as Bengali in this old Bhojpuri movie poster.